The Sonshine Toy Library opened in 1982, and since then has been committed to providing quality toys for young families within Warragul and the surrounding community. The Toy Library initially was run by volunteers, until, in 1999 the committee employed its first Toy Library Co-ordinator. Our co-ordinator is employed for 15 hours each week. 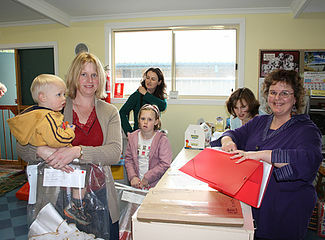 Kerryn is the coordinator of Sonshine Toy Library Warragul and Drouin. Kerryn is employed by the Sonshine Toy Library Committee and is on duty during the open hours, with the assistance of several volunteers. She always has an open ear and a sympathetic heart. It is not unusual for a slightly frazzled parent to find themself themselves receiving comfort from an understanding Kerryn. She has a Diploma in Children’s services & has raised three children to adulthood. Most of Kerryn’s parenting was as a single parent and her children’s early years were spent in India. 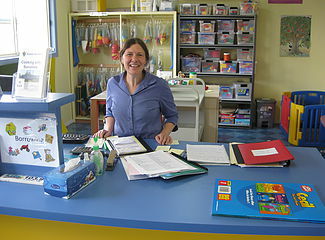 Ailsa is one of the coordinators of Sonshine Toy Library Drouin. Ailsa is appointed by the Sonshine Toy Library Committee and is on duty on Friday. Ailsa has been a teacher with the Warragul Special School and has a wealth of experience in children’s development and learning. She has raised four children to adulthood and enjoys weekly visits with her granddaughter. Ailsa has also travelled the world and experienced many cultures. Both Ailsa and Kerryn value giving courage to parents affected by sleep deprivation or feeling isolated from family. If you approach them on any day with the cue words, “Can we have a cuppa”, they will be very pleased to sit down and listen and help you get perspective for the day. Both are also available to help choose age appropriate toys. Sonshine Toy Library is run by a committee of Christian volunteers from various churches within the Baw Baw Shire. The committee aims to provide a wide range of good quality, educational toys to assist in the development of children from 3 months to seven years of age. They meet 6 times a year to, among other things, organise fund raising events and apply for grants (to provide for the operational costs and the coordinator’s wages), ensure toys are well maintained, general maintenance of building and grounds and provide support for the coordinator. The committee also helps oversee the smooth running of the Toy Library.